Quality goes into every home we build at “The Villages”. It is our hope that this effort will be obvious to our residents in the luxury and function of their private homes, in the beauty and comfort of the public spaces of the community, and in the way the members of our staff meet their responsibilities with courtesy, thoughtfulness and professional efficiency. We want you to feel at home here from the moment you arrive. ​Camellia Place – All lots currently SOLD OUT. Georgetown – All lots currently SOLD OUT. 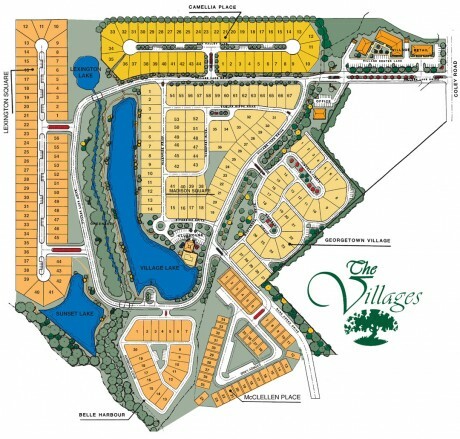 McClellan Place – An exclusive village with many house plans from which to choose. This village has 17 lots just waiting for you. Belle Harbour – A unique village with the feel of New Orleans. This village offers the feel of the bayou without ever leaving your front porch. We currently have 17 lots awaiting you. Lexington Square – This is the newest phase of our development. We currently have 38 lots just waiting for you to build. This village is located at the rear of our subdivision and is nestled between beautiful wooded areas and an adjoining pond plays host to many of our wildlife population. Madison Square – The popularity of this village is apparent. We have only 7 lots to offer home owners so pick your lot fast. Madison Square is a unique village and is within walking distance of the Village Clubhouse. We’d love to show you around The Villages of Tupelo!